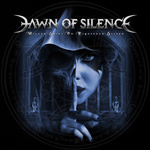 Long serving Swedish metal band Dawn of Silence began in 2002 as several high school friends gathering to cover Iron Maiden songs. Eight years later the influence remains on their second full-length disc Wicked Saint or Righteous Sinner; however, they sound more like Mandrake-era Edguy, early 21st century Maiden heir apparent. Patrik Johansson is a dead ringer for Tobias Sammet (with a stronger voice), and so much so I had to check the credits twice to make sure he wasn't the guest vocalist (on every song). It's a good thing I'm a fan of both melodic heavy metal and Edguy, or Dawn of Silence would be nothing but an expert doppelganger, or worse, a parody. Nevertheless, DOS puts the heavy back into melodic metal as Wicked Saint or Righteous Sinner is charging freight train of music. The pace hardly relents throughout, but this heaviness is wrapped up in melodic arrangements woven from crisp guitar work and immense vocal arrangements. Six of the ten songs here clock around four minutes or so; yet from the density metal swelling each work, every song has the power to blow your speakers. WSORS is pure melodic heavy metal as it should be with Chasing the Ghost, Release Me, Cage of Fear, and Haunted Dreams being some of the best. Quite recommended! Dawn of Silence puts the heavy back in melodic heavy metal on Wicked Saint or Righteous Sinner. It's fierce pace is only tempered by its power melodies, fret work and vocal arrangements.